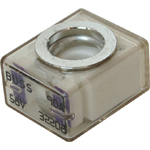 This series of color coded DC fuses ranges from 30 to 300 Amps and can be mounted to battery terminals or battery switches using special single or dual fuse holders. 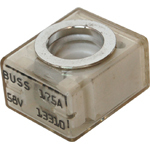 Ignition protected and suitable for use in enclosures with gasoline engines, these fuses have a high enough interrupt rating to permit them to be used as primary circuit protection on large battery banks. 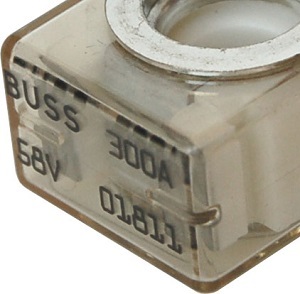 The fuses have a visible window to see blown condition. 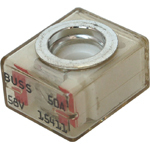 The compact nature of these fuses and their holders makes them particularly suitable for refits or when trying to bring an existing installation into compliance. 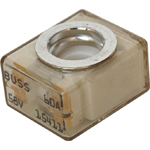 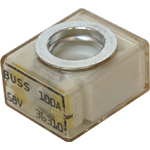 Use in conjunction with fuse holder p/n 2151 or 5191, not for use in any other mount.